Automatically loads for visitors browsing your site on smart phones and other mobile devices, giving them a greatly improved browsing experience. Quick to set up. A few lines of code and you can have the best mobile web browsing experience within a day ! Free updates to accommodate future mobile devices. Build on the finest framework out there ensuring unbeatable support for all iOS, Android, BlackBerry and Windows devices. MOBILE TRAFFIC TO EXCEED DESKTOP TRAFFIC IN 2013 ? Opportunities for mobile-friendly sites are growing larger every day. As of 2012, mobile traffic alone makes up to 35% of all Internet use the world over, and more users are expected to access the Internet through their mobile phones that their desktops by the end of 2013. 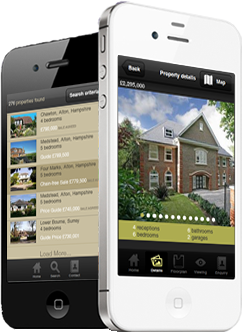 Yet with that level of upward mobility, recent studies show that only 10% of estate agent websites have optimized for mobile devices. Consumers are becoming less patient with sites that are not ready for the mobile age. 48% are frustrated when they visit non mobile-friendly websites. 52% of users who have bad mobile experiences are less likely to engage with the companies. 48% say that, when sites don’t work well on their smartphones, it makes them feel like the companies don’t care about their business. A recent Econsultancy study finds that, among the top 5 most exciting opportunities for websites, mobile optimization is at the top, ahead of even social media engagement. 78% - swift navigation to desired information within one to two taps. 73% - find contact information, tap-to-call, mobile optimized contact forms. We are not making these numbers up. Visit this Google study conducted by Sterling Research adn SmithGeiger market research firms. Our prices start from just £40.00 per month for a one or two branch agency with zero set-up costs. This includes Hosting, Mobile Detection Service, as well as hosting and caching of your images on one of the best Content Distribution Network out there. Are you a large agency with more than a few branches? Never fear – just get in touch and we’ll talk you through our flexible pricing policy.